Our cross-generational, multi-cultural, global team had millennials Kirill Pavlov, a data scientist and tech recruiter from Terminal1, Carrie Au, a marketing analyst from Sunlife and Ignacio Gorrono, an engineering student from Madrid interning in Shanghai. 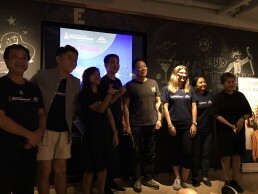 The team included seasoned professionals Mike Harris, a senior educator from Ontario, Canada and myself, founder and design director of Amplify, Hong Kong. Over 54 intense hours, our cross-generational team –meeting for the first time ever– aligned diverse viewpoints and skills to collaborate in every sense and come up with a solution that addresses a real human need and created a viable business model to deliver it. Mike’s calm demeanour and knowledge expertise grounded us all, Kirill’s data knowledge and nimble keyboard skills quickly created a platform for the concept, Carrie’s agile marketing mind looked at figures and channels for the go-to-market plan, intern Ignacio used up his last few RMBs to fly in from Shanghai for this event and his passion and drive kept him (and us) going and my ‘less is more’ and ‘a picture is a thousand words’ design philosophy made sure the logo was effective, the colours right and that our presentation pulled the right heart strings. Judges Rebecca Yun, founder Golden Foundation, Andrea Wong, Chief Marketing and Customer Officer, AXA Hong Kong, Karena Belin, Co-founder W Hub, and Tim Wu, Programme Director Eureka Nova Startup Incubator, asked searching questions and deliberated over a quick dinner before announcing results and telling us why our ideas made the grade. Congratulations to the team that came first: their idea was smart and sensitive and in the words of a judge “Addressed a real pain point in the city” (Hong Kong). 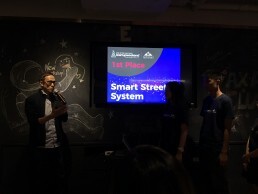 The two teams that were third runners-up came up with innovative concepts to help people nurture personal relationships in the stressful urban environment of Hong Kong. Over 54 intense hours, our cross generational team –meeting for the first time ever– aligned diverse viewpoints and skills to collaborate in every sense and come up with a solution that addresses a real human need and created a viable business model to deliver it. Belinda Esterhammer of Startupweekend was the vocal glue holding the event together, Felix Wong of Techstars provided quiet reassurance, Priyanka Gothi of Retired Not Out was her bright and bubbly self, brimming over with ideas, AXA’s well designed venue in Wong Chuk Hang allowed participants to be in the thick of start-up action or gaze in solitude at the hills around, Goodcake’s yummy brownies gave us a sugar kick at the right time and other mentors and participants energised the weekend with their passion. “Whether its grey or black today I can see a mix of it”– a judge’s feedback.